At this point in winter, nothing sounds better than D.C.’s famous cherry blossoms in full bloom on a gorgeous spring day. Of course, D.C. isn’t the only place with cherry blossom-related festivities. Alexandria, Va., is hosting its own celebrations to coincide with the National Cherry Blossom Festival in D.C. The festival will give tourists and locals alike a chance to explore Alexandria’s history through food, tours and everyone’s favorite spring blooms. This is where to be to get a flavor (literally) of Alexandria. The guided walking tour includes fun facts about the city’s architecture, a lesson on the history of cherry blossoms in D.C. and -- obviously most importantly -- samples of cherry-centric dishes at local restaurants. The tours will run Wednesdays at 11:30 a.m. and Saturdays at 2 p.m. from March 22 to April 12. You can book a tour for $49 via D.C. Metro Food Tours. If you want to get a little more exercise with your cherry blossoms, this is the activity for you. Bike and Roll is offering three-hour bicycle tours of the cherry blossoms that span from Old Town Alexandria into D.C. via the Mount Vernon Trail. The tour extends all the way to D.C.'s tidal basin and includes more history lessons on those beautiful buds. The tours will run Fridays, Saturdays and Sundays from April 4 to April 13, departing from Bike and Roll Alexandria at the Alexandria waterfront at 1 p.m.
Tours can be booked for anyone 13 and older for $40. You can reserve a tour now at Bike and Roll’s website. Here's a rare opportunity to see the cherry blossoms from a new perspective. The Potomac Riverboat Company is offering cruises along the Potomac River to Georgetown that will showcase fresh views of the cherry blossoms and monuments. The cruises will run Saturdays and Sundays from March 29 to April 13, departing from the Potomac Riverboat Company (1 Cameron Street) at the Alexandria waterfront at 11:30 a.m., 1:30, 3:30 and 5. p.m.
Tickets are available at the Potomac Riverboat Company’s website for $26 (adults) and $14 (children ages 2-11). Tourists, pay attention. 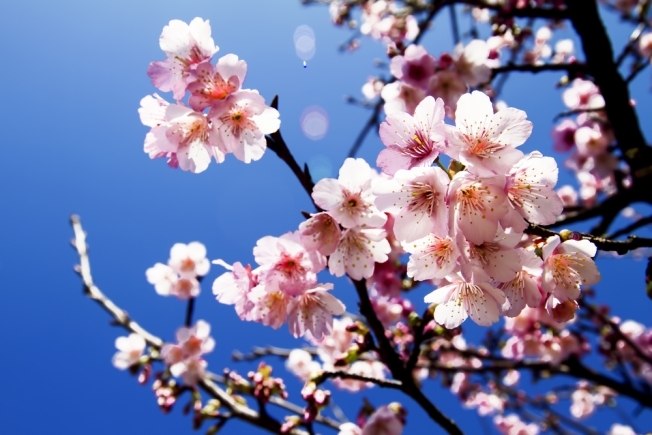 Kimpton Hotels is offering a blossom-themed hotel package that includes handcrafted cherry blossom soap, a $25 room credit for meals and parking, and a bubble welcome for the kids to enjoy. The packages will be available March 20-April 13 at the Hotel Monaco Alexandria, Lorien Hotel and Spa, and Morrison House. Rooms can be booked at Kimpton’s website.